The chart graphs gas consumption per person against the average price of a gallon of gas in 128 countries. The size of each circle represents the size of each country’s population. As you can see, not a single country consumes anywhere close to as much gas per person as the U.S. does. That’s despite the fact that many countries, such as Venezuela and Egypt, push the cost of a gallon of gas well below the the price in the U.S. by heavily subsidizing their largely nationalized oil industries. 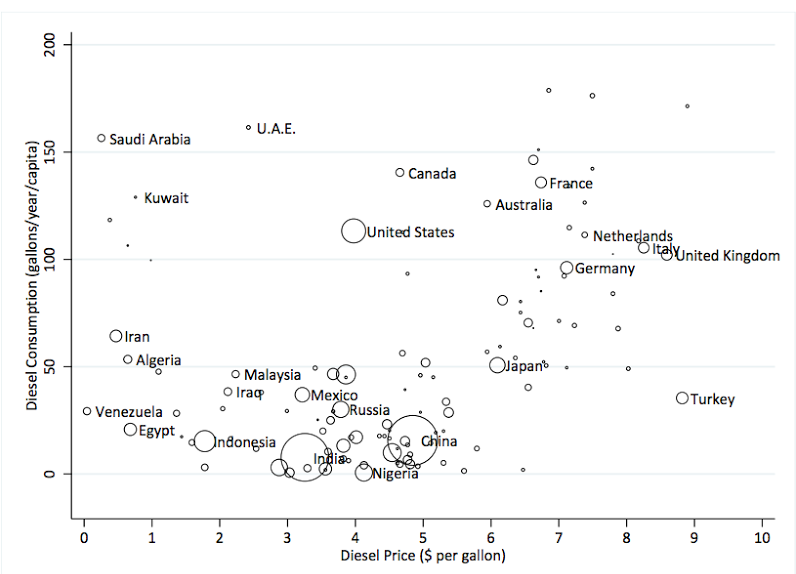 It should be noted that some nations rely more on diesel fuel than gas. 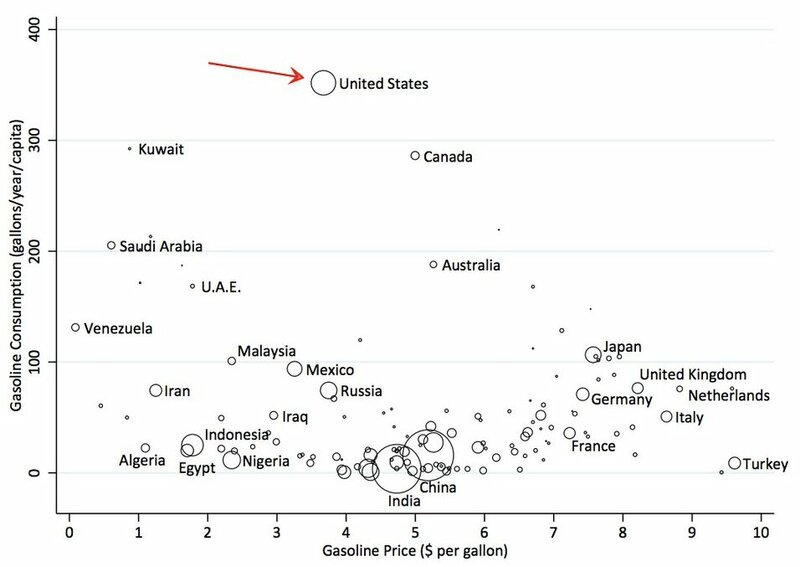 But even when you add per-capita diesel consumption into the equation, only Kuwait and Canada come close to the U.S.
All of this gas-guzzling has a big impact on climate change. Of all U.S. greenhouse-gas emissions in 2011, more than a quarter came from transportation, according to the U.S. Environmental Protection Agency. Only the country’s enormous electricity sector accounted for a larger share of emissions than that. And more than half of all U.S. transportation emissions come from gas-burning cars, pickup trucks, minivans and SUVs, according to the EPA. Globally, gas consumption shows no signs of slowing down. By 2015, the Berkeley report estimates, we will be consuming some 90 million barrels of oil every day. Those fuel subsidies that keep prices cheap in many countries are a big part of the problem, Davis argues. Global fuel consumption would suddenly drop by 29 billion gallons per year if we simply eliminated all the subsidies, according to Davis. Many developed countries, but not the U.S., have altered their economies to successfully run without such high levels of consumption. Take Germany, for example: The world’s fourth largest economy, according to the World Bank, often tack on taxes north of $4.00 per gallon, according to the report. In contrast, the U.S. only taxes each gallon of gasoline at 49 cents, on average. Anything higher, the typical argument goes here, would crush the economy. And yet Germany is arguably the most successful economy in Europe, despite its super-high gasoline taxes. So, like, we can probably do better. This post has been updated to include additional information about the countries' per-capita consumption of diesel fuel.